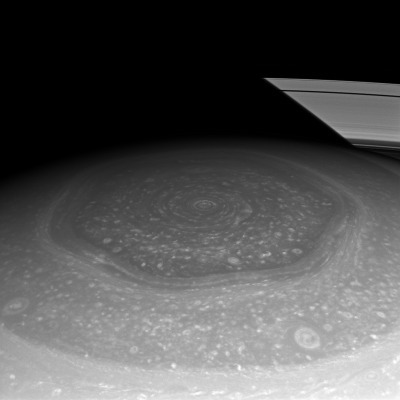 Have you ever seen anything more astounding or beautiful than Saturn's hexagonal storm system in its north pole? The clouds at the very center are spinning rapidly - almost twice as fast as the planet itself, with a period just over six hours. The direction of rotation is counterclockwise, like a northern hemisphere hurricane on Earth, except there is no ocean underneath. 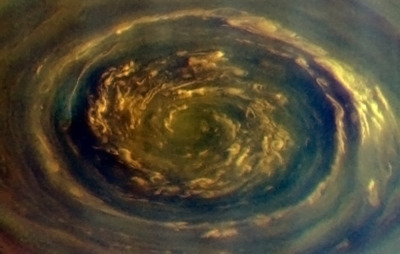 A similar feature exists at Saturn’s southern pole, and it spins in the same direction as that of a southern hemisphere hurricane on Earth. However, the hurricanes on Earth begin in the tropics and drift around. 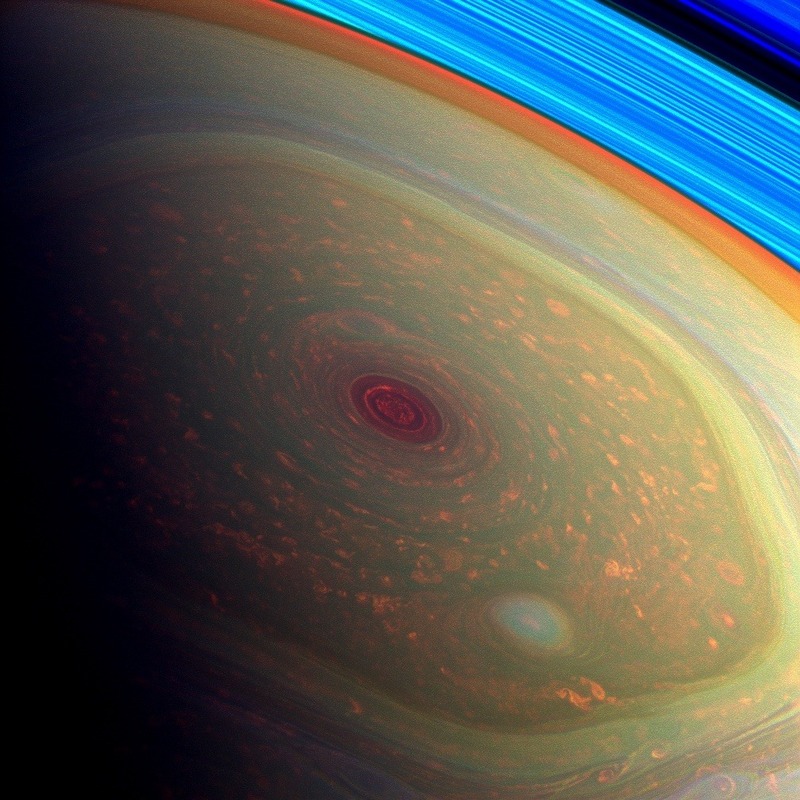 The polar hurricanes on Saturn are locked to their poles. The bright clouds form a tightly wrapped spiral that traces a path toward the center as one follows it in a counterclockwise direction. 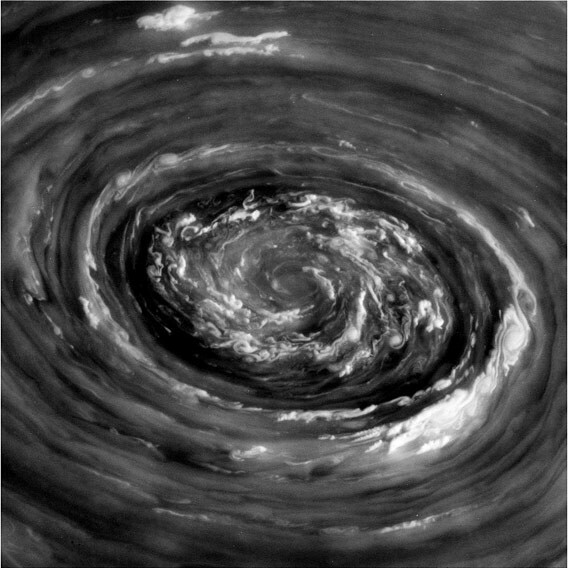 This spiral could be a wave or actual particle motion toward the center from a disturbance further out. Or it could be the remnants of a compact cloud that got sheared apart by the higher angular velocity closer to the center. Choosing among these possibilities is the subject of ongoing research. 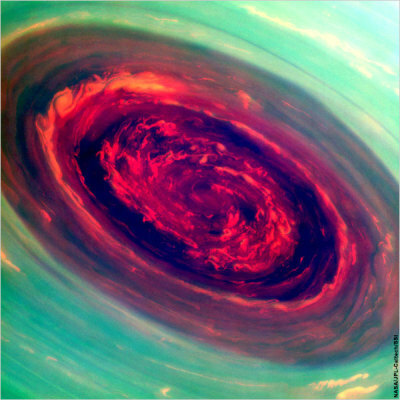 NASA also has a great little video of this massive, freakishly shaped hurricane here. Absolutely stunning pictures. Thanks for sharing. AHHH!!! That's so pretty and amazing, it almost makes me angry. Fight or flight must be kicking in.